In Mass Effect 1 you are given an assignment to visit the Alliance Lunar station and stop a rogue VI, a reasonably simple task really. One that if you over looked it wouldn't feel as though you had missed out on anything spectacular. The maps where the same as the other bunkers used in other missions, there where no huge fights, just a simple go in kill some drones and torrent and disconnect the VI. In Mass Effect 2 we meet EDI, for a Renegade Shepard the response is instant distrust followed by Miranda advising EDI that Shepard's spent a lot of her time fighting rogue AI's, Geth mostly, but there was that one on the Lunar base. Then in Mass Effect 3 we discover, by going through the record terminals while raiding the Cerberus base, that EDI is the Lunar VI who gained consciousness while under attack. 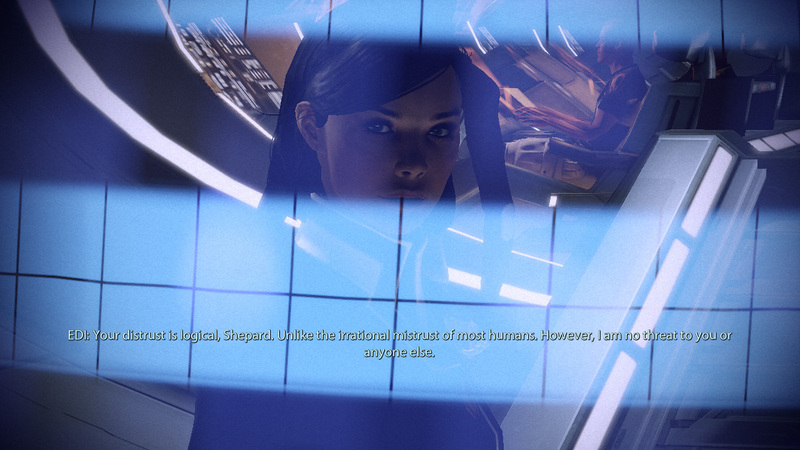 For PS3 players there is a simple mention of "Your that VI I heard about" but for people who where able to play Mass Effect 1 the conversation acknowledges their strained beginning. This is just another example of who all the little pieces of the puzzle fit together ... when you have the full story! Why Would You Like To See Mass Effect 1 On PS3?